12pm Elissa and Gina are in the lounge room talking. Gina starts talking about how she and Nick have chemistry and that he doesn’t want to hook up in the house. She says that she likes a guy back in New York and doesn’t want to ruin it with him. Gina then starts talking about the votes. She says that she wants to compete with the best. Elissa says okay wait why are you talking about Nick. Did someone say I said something about it? Gina says no, I just want people to know I like this guy at home and I know Nick isn’t here to hook up. Gina says I don’t cheat on tests, I don’t lie, etc… Elissa says I have to be honest with you, when I first met you, you are an energetic fun girl. It disappointed me that you made a connection with the mean girl Aaryn and I didn’t like that. You are 33 years old. Gina says that Aaryn reminds her of a girl back home that she helps out. Elissa says when you said that my voice is like nails on a chalk board when I haven’t even talked with you. 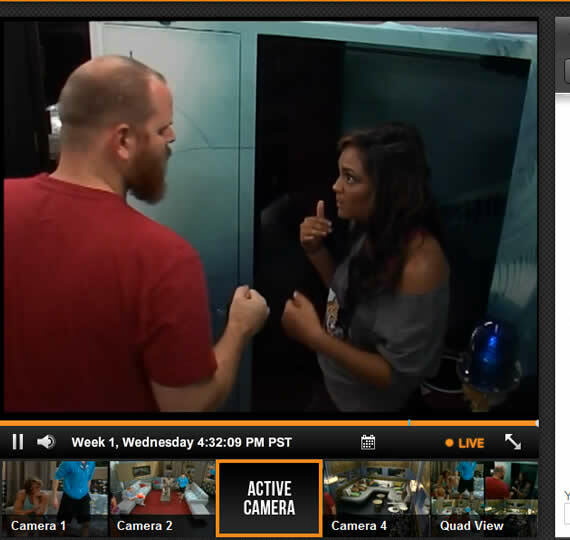 10am Big Brother switches the live feeds to the we’ll be right back screen. When the feeds come back – McCrae, Judd Jessie and Aaryn are out in the backyard chatting. Jessie comments that she loves they played 5 songs this morning. Aaryn and Judd head inside. McCrae says to Jessie happy July 4th, what a bummer. Jessie asks what he means. McCrae says the they’re missing it. Jessie heads up to the HOH room with Aaryn. Jessie asks if Aaryn is doing okay with David today. Aaryn says yeah, it’s just really hard to see David’s picture blacked out. Kaitlin joins them. Kaitlin says lets just let Jeremy do all the socializing this week. Kaitlin says I am upset with Howard. Aaryn says I better get a good job out of this! I need to be the new interior designer for Big Brother, obviously! 1:40am Helen and Spencer are talking in bed. Spencer says this is going to be a tough week, but if you get it (MVP) whoever you put up I will support. Helen say yeah I won’t touch you, McCrae, Howard, Andy. Spencer says yeah, when she (Elissa) got it she went up and told McCrae. Spencer says so there is a bit of time before the POV when you get it. Spencer says that she will probably get it again. Spencer says I know they don’t trust Jessie, or Nick. Spencer asks what would you do if you were in my shoes would you keep denying. Helen says yeah I think so. Helen says we’ll hangout in the havenot room a lot. Up in the HOH room – Kaitlin, Jememy, Aaryn and Ginamarie. Jeremy tells them that Jessie came up here last night and the three that we (Kaitlin and Jeremy) had $ex. I told her you don’t know what’s going on, don’t comment. Kaitlin is shocked and asking WHAT?! She told everyone we had $ex?!!? Aaryn wants to know who “Everyone” is because she was talking about voting out David. The First Big Brother 15 Live Eviction results. Like most first weeks on Big Brother this week was a very busy on the feeds. We have many alliances working in the house. The moving COmpany (MC), BB Bunnies, Boats ‘n’ Hoes, South Mississippi psychos (Aka friendship), and a bunch of side alliances and pairs/showmances. Really it’s just the first week and I’m starting to think that the all powerful MC will start to feel the heat tonight. Really depends on Candace. If she votes out David then Boats ‘n’ Hoes knows that one of their members voted out David if she votes out Elissa the MC will blame Nick’s David vote on Candace. Either way tonight is going to be wild on the feeds. Helen is telling Candace to vote out David, Spencer telling her to vote out Elissa. Who will she pick? As for Jessie.. whos that? 9:30am In the kitchen – Elissa is asking David about different areas of California. She asks him how far way from Palm Springs he is. He says 3 hours. Amanda says its the gay people and old people capital of California. After less than a week of the Big Brother 15 live feeds the after affects of the words and actions of the house guests inside the house are already starting to change their lives outside of the house. With every moment of the house guests time inside the big brother house being watched and documented by millions across America it is not surprising that the comments and views of some of the house guests are causing alarm outside the house. Numerous house guest have made a startling amount of racist, homophobic and misogynist comments. The list of house guests making these comments is growing and so far includes: Aaryn Gries, GinaMarie Zimmerman, Kaitlin Barnaby, David Girton, McCrae Olson, Jeremy McGuire, Spencer Clawson, and Amanda Zuckerman. 1:50am Spencer, Andy, Amanda and Judd are up in the HOH room. Amanda starts talking about Nick and how he is acting shaddy. 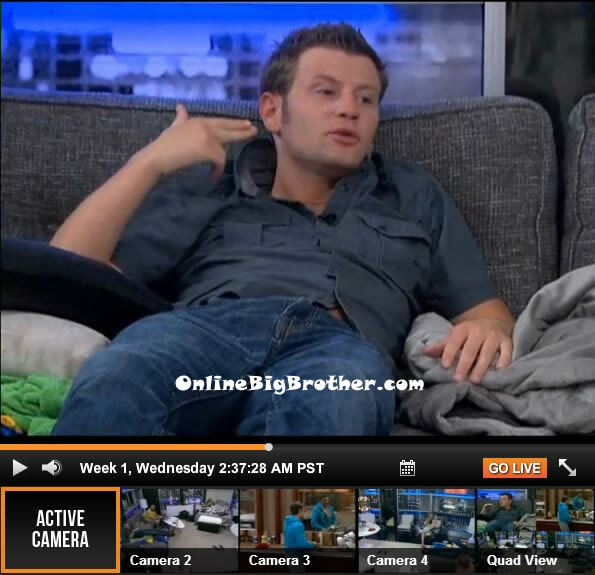 Judd comments that Nick gets called to the diary room more than anyone else. Amanda says that Nick doesn’t talk game with her at all. Judd tells the others that he forgot to go to the diary room to request holy water for Aaryn’s exorcism. They all laugh. Andy tells Spencer and Amanda he will talk to Helen tomorrow. Spencer says to tell her to get her sh*t together. Spencer tells Andy that Helen can’t feel sorry for these people. Andy says he will. Amanda brings up how they need Candice’s vote. Spencer says that he’s got Candice and says that he will tell her tomorrow. Spencer tells them that they’ll call their alliance the “Bad Dudez with a z”. McCrae comments that he loves it. Amanda tells them that she doesn’t like that name, first off its dudes, I am not a dude. They tell her that she is out voted. Amanda tells them that Elissa is getting on her nerves. Spencer says that as soon as someone else wins MVP they won’t need Elissa anymore.